Today, dozens of websites “slowed down” for a cause, collectively advocating against Open Internet rules proposed by the Federal Communications Commission. None of the participants in today’s “Internet Slowdown Day” actually delayed access to their websites: instead, they used code to add a layer to visitors’ Web browsers with one of the loading icons grimly familiar to anyone who’s ever waited for a long download or crufty operating system function to finish in an overlay and linked to BattleForThenet.com/September10, which encouraged visitors to sign a letter supporting net neutrality, or to use online tools to call Congress. 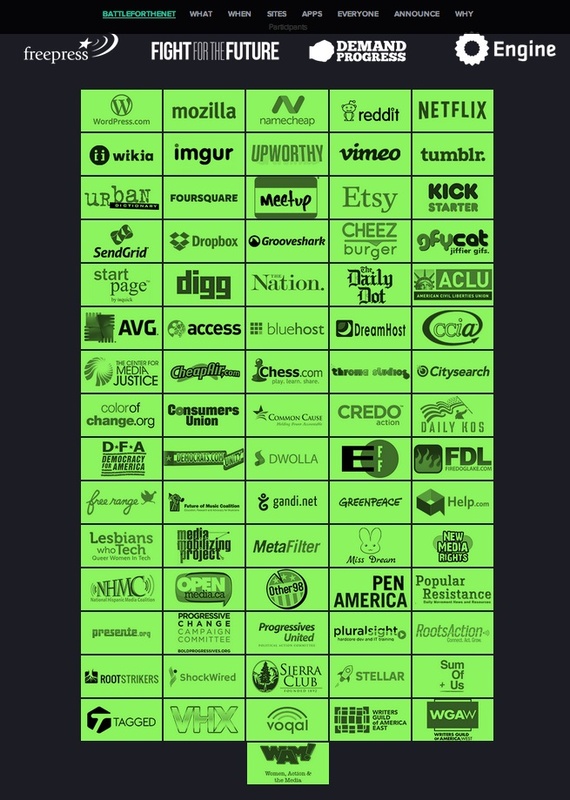 While many big tech companies didn’t participate, millions of visitors to Reddit, Tumblr, Netflix, Free Press, Reddit, Netflix, Mozilla, Kickstarter, Upworthy, Automattic, Digg, Vimeo, Boing Boing, Urban Dictionary, Foursquare, Cheezburger and the Sunlight Foundation saw the spinning icon, among others. That means there have been at least 409,522 reply comments filed since July 18, with five days left in the reply comment period, with more than one quarter of them coming in a single day. (*If Fight for the Future’s total is correct, the number of reply comments filed passed 800,000, with the total nearing 2 million.) The FCC will host a public Open Internet roundtable discussion on September 16, the day after the period closes. According to an analysis of the first 800,000 public comments by the Sunlight Foundation, less than 1 percent of the submissions were clearly opposed to net neutrality. These numbers are still dwarfed by the millions of calls and emails sent to Washington during the campaign to halt the Stop Online Piracy Act (SOPA) and PROTECT-IP Act in Congress in 2012, when Google and Wikipedia connected visitors to their websites to switchboards on Capitol Hill. They may also have less of an effect on an independent regulatory agency that has yet to chart a sustainable legal course in the storm of online criticism and intense lobbying by affected industries. The total number of comments on the Open Internet proceeding is sure to grow in the remaining week, with the number of emails sent to the FCC’s dedicated inbox likely to go past a million. 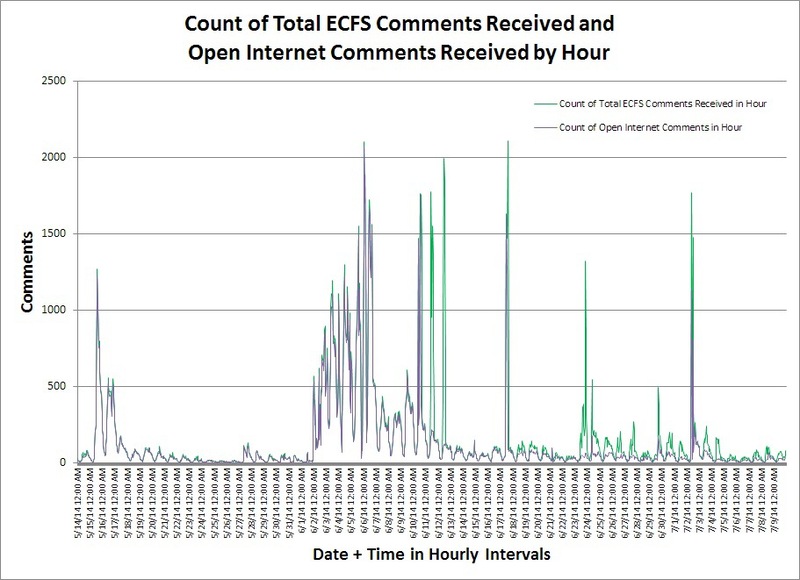 (Update: On Thursday morning, the FCC confirmed that a total of 632,328 comments filed to ECFS and 1,118,107 sent to openinternet@fcc.gov, for a cumulative total of 1,750,435.) In many ways, that outcome feels appropriate. 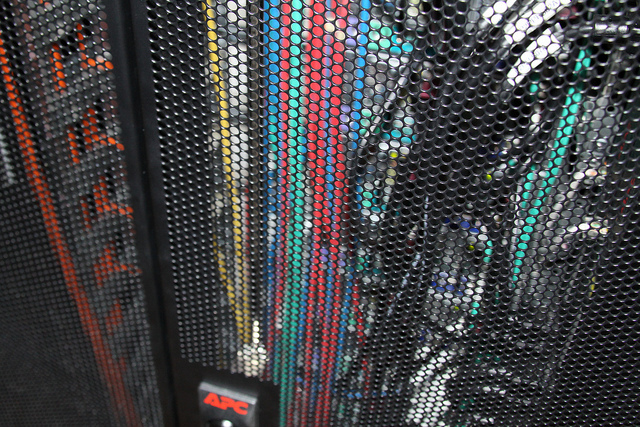 When the FCC’s 18 year-old online commenting system has groaned under a huge volume of online traffic, people have routed around the downed comment system and used the original killer app of the Internet: email, the “tremendous, decentralized, open platform on which new, innovative things can and have been built,” based upon the same kinds of open protocols that enabled the unprecedented growth of a wealth of networks to grow around the world. Update: At the end of the day after the Internet Slowdown, the FCC still working to enter all of the new comments created the day before into their systems — and the agency decided to offer another way to file comments: using email attachments. filing bulk comments collected by advocates, at least until Congress funds a new online filing system or the agency finds a way to use Dropbox. It should certainly make releasing them online as structured data for third-party analysis much easier; if the FCC wanted to, if could publish them almost as quickly as the comments came in. The volume of public feedback in the Open Internet proceeding has been commensurate with the importance of the effort to preserve a free and open Internet. The Commission is working to ensure that all comments are processed and that we have a full accounting of the number received as soon as possible. Most important, all of these comments will be considered as part of the rulemaking process. While our system is catching up with the surge of public comments, we are providing a third avenue for submitting feedback on the Open Internet proceeding. In the Commission’s embrace of Open Data and a commitment to openness and transparency throughout the Open Internet proceedings, the FCC is making available a Common Separated Values (CSV) file for bulk upload of comments given the exceptional public interest. All comments will be received and recorded through the same process we are applying for the openinternet@fcc.gov emails. Attached is a link to the CSV file template along with instructions. Once completed, the CSV file can be emailed to openinternet@fcc.gov where if it matches the template the individual comments will be filed for the public record with the Electronic Comment Filing System. When you email this file, please use the subject “CSV”. We encourage CSV files of 9MB or less via email. The Commission welcomes the record-setting level of public input in this proceeding, and we want to do everything we can to make sure all voices are heard and reflected in the public record. This morning, the Federal Communications Commission (FCC) voted 3-2 to approve a Notice of Proposed Rulemaking (NPRM) on Open Internet Rules. The commission has released a fact sheet on the rules to the media and published the release online as a .doc, .pdf, HTML and .txt. I’ve published the FCC FAQ below and linked to the NPRM on Protecting and Promoting the Open Internet. Should the FCC should bar paid prioritization completely? Should the FCC apply Open Internet rules to mobile broadband Internet service, not just fixed broadband Internet? Should the FCC reclassify broadband Internet service as a telecommunications service under Title II of the Telecommunications Act? As of May 15, the FCC Open Internet docket has received 21,017 comments. More are sure to pour in over the next four months, given the FCC’s controversial proposal to allow paid prioritization. You can see other comments and submit your own comments at Docket 14-28 or email them to openinternet@fcc.gov. Your email address will then become part of the Open Internet Rule docket. The Internet is a vital platform for innovation, economic growth and free expression in America. And yet, despite two prior FCC attempts, there are no rules on the books to prevent broadband providers from limiting Internet openness by blocking content or discriminating against consumers and entrepreneurs online. The “Protecting and Promoting the Open Internet” Notice of Proposed Rulemaking (NPRM) begins the process of closing that gap, which was created in January 2014 when the D.C. Circuit struck down key FCC Open Internet rules. This Notice seeks public comment on the benefits of applying Section 706 of the Telecommunications Act of 1996 and Title II of the Communications Act, including the benefits of one approach over the other, to ensure the Internet remains an open platform for innovation and expression. While the Notice reflects a tentative conclusion that Section 706 presents the quickest and most resilient path forward per the court’s guidance, it also makes clear that Title II remains a viable alternative and asks specifically which approach is better. In addition, the proposal asks whether paid prioritization arrangements, or “fast lanes,” can be banned outright. Since February, tens of thousands of Americans have offered their views to the Commission on how to protect an Open Internet. The proposal reflects the substantial public input we have received. The Commission wants to continue to hear from Americans across the country throughout this process. An extended four-month public comment period on the Commission’s proposal will be opened on May 15 – 60 days (until July 15) to submit initial comments and another 57 days (until September 10) for reply comments. Reflects the principles that Chairman Wheeler outlined in February, including using the Section 706 blueprint for restoring the Open Internet rules offered by the D.C. Circuit in its decision in Verizon v. FCC, which relies on the FCC’s legal authority under Section 706 of the Telecommunications Act of 1996. At the same time, the Commission will seriously consider the use of Title II of the Communications Act as the basis for legal authority. Seeks comment on the benefits of both Section 706 and Title II, including the benefits of one approach over the other to ensure the Internet remains an open platform for innovation and expression. Explores other available sources of legal authority, including also Title III for wireless services. The Commission seeks comment on the best ways to define, prevent, expose and punish the practices that threaten an Open Internet. Proposes a requirement that all users must have access to fast and robust service: Broadband consumers must have access to the content, services and applications they desire. Innovators and edge providers must have access to end-users so they can offer new products and services. Considers ensuring that these standards of service evolve to keep pace with of innovation. Asks if paid prioritization should be banned outright. Promises clear rules of the road and aggressive enforcement to prevent unfair treatment of consumers, edge providers and innovators. Includes a rebuttable presumption* that exclusive contracts that prioritize service to broadband affiliates are unlawful. Enhance the transparency rules to provide increased and specific information about broadband providers’ practices for edge providers, consumers. Asks whether broadband providers should be required to disclose specific network practices, performance characteristics (e.g., effective upload and download speeds, latency and packet loss) and/or terms and conditions of service to end users (e.g., data caps). Tentatively concludes that broadband providers should disclose “meaningful information” about the service, including (1) tailored disclosures to end users, (2) congestion that may adversely impact the experience of end users, including at interconnection points, and (3) information about new practices, like any paid prioritization, to the extent that it is otherwise permitted. Proposes the creation of an ombudsperson with significant enforcement authority to serve as a watchdog and advocate for start-ups, small businesses and consumers. Seeks comment on how to ensure that all parties, and especially small businesses and start-ups, have effective access to the Commission’s dispute resolution and enforcement processes. Considers allowing anonymous reporting of violations to alleviate fears by start-ups of retribution from broadband providers. Considers the impact of the proposals on groups who disproportionately use mobile broadband service. Asks whether any parts of the nation are being left behind in the deployment of new broadband networks, including rural America and parts of urban America. This post has been updated with addition statements and revised as the FCC put more documents online. 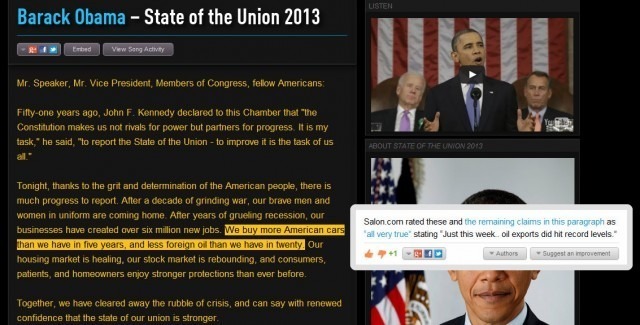 Can NewsGenius make annotated government documents more understandable? “The federal government can now unlock the collaborative “genius” of citizens and communities to make public services easier to access and understand with a new free social media platform launched by GSA today at the Federal #SocialGov Summit on Entrepreneurship and Small Business,” writes Justin Herman, federal social media manager. This could be a significant improvement in making complicated policy documents and regulations understandable to the governed. While plain writing is indispensable for open government and mandated by law and regulation, the practice isn’t exactly uniformly practiced in Washington. If people can understand more about what a given policy, proposed rule or regulation actually says, they may well be more likely to participate in the process of revising it. We’ll see if people adopt the tool, but on balance, that sounds like a step ahead. What could this look like? As Herman noted, Chicago’s SmartChicago Collaborative uses RapGenius to annotate municipal documents. Another recent example comes from DOBTCO founder and CEO Clay Johnson, who memorably put RapGenius to good use last year decoding testimony on Healthcare.gov. 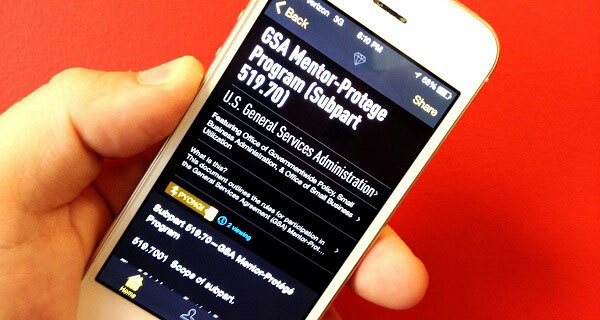 The GSA’s first use is for a mentor-protege program. Here’s hoping more subject matter experts start annotating.